Now that summer is winding down and the kids are back in school, September is the perfect time of year to start planning out what you want for your business in 2019. Many small business owners and Bombshells alike forget to complete this crucial step for business success until it’s too late in the year. If you’re trying to plan out your business after mid-October, you will be putting yourself and your business at a disadvantage because the process I’ve outlined below takes about 30 days to complete. Being hungover on Butterball turkey while trying to build out your benchmarks for next year is not something I would recommend (speaking from experience). So I suggest getting your business plan crafted before Thanksgiving hits! 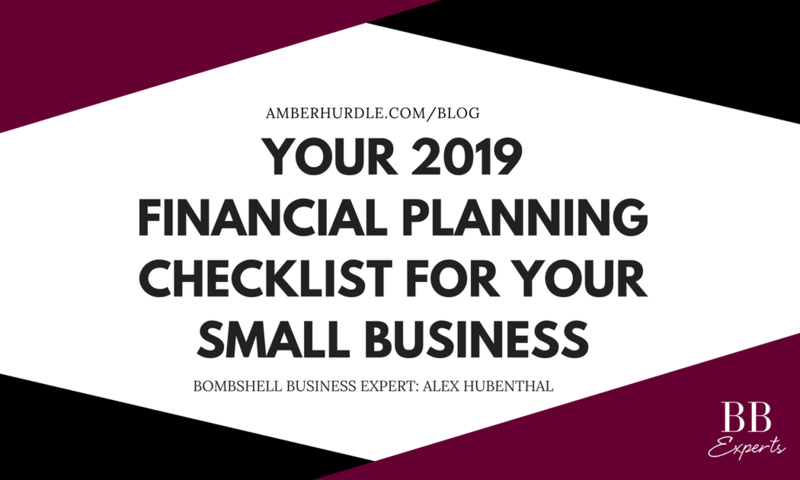 In order to blow up your business in 2019 we need to do the following NOW: benchmark, set targets, and establish the budget. Setting and establishing benchmarks are one of the best ways you can identify the customers who are your most profitable and those who are your least profitable. To really set yourself apart from your competitors, you need to know what those numbers are. The most popular metric in calculating these numbers is your Customer Lifetime Value or CLV. Before you start, it is VERY IMPORTANT that you do not proceed until you know what it costs to sell your product or render your services to your customers. If you sell products, calculate your profit by finding the difference of the cost to acquire your product less the total sales generated. Look for repeat customers. If you are a service-based business, know how much time you put into servicing a client and how much it costs to acquire the client. If you aren’t sure what those numbers are, spend the next 30 days tracking ALL of your time using a time tracking software and then come back to proceed. A free tool that I use is called Clockify. (Annual Profit per Customer) x (Average Time in Years They Remain a Customer) – (Customer Acquisition Cost). To use as an example, Bombshell, Inc. charges a set monthly fee to your clients. This set monthly fee was recently introduced to your business. On average, your clients stay with you for 2.5 years and you charge them $1,000 per month. The cost to acquire your client is $25 on Facebook Ad Spend plus a 1-hour consultation. Why is this important? You are more likely to find more of your best customers by asking for referrals from customer “C” than you are “A” or “B”. Why? People by nature, hang out with other people that have similar habits and tastes. 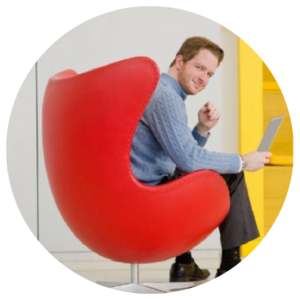 Now that you have identified your best customer(s), you can set your benchmark. You benchmark should ALWAYS be based on your best clients. Those that are multiple repeat clients, or those that bring you the most profit with the least time involved. Assuming your business has been generating revenue for a little while, you should have started to notice trends in your revenue, expenses, and your profit. For sake of the length of this article, we will focus on revenue here, but the same math can be applied to expenses and profit. 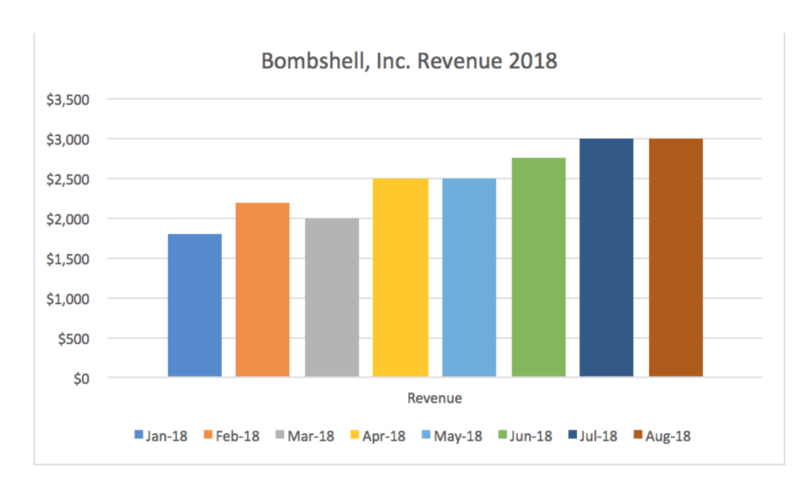 Below are revenue numbers for each month of the year so far in 2018 for Bombshell, Inc. Without getting into too much math, we can take the average growth of Bombshell, Inc. so far in 2018. Assuming that Bombshell, Inc. continues to grow at this rate, you will finish off the year at $3,600 in revenue in the month of December 2018. Now I want you to think critically on your Business’s growth rate going into 2019. Is it possible? How much more effort would you have to keep this growth up? Did you do the math? Perfect. Now, I want you to double that number. There’s something that I learned from sales and marketing genius, Grant Cardone. His philosophy is if you set a realistic target, you will never achieve it. It’s better to aim for a higher (unreasonable) target because if you fail, you’ll end up better off than you would have if you stuck with the initial number you had. 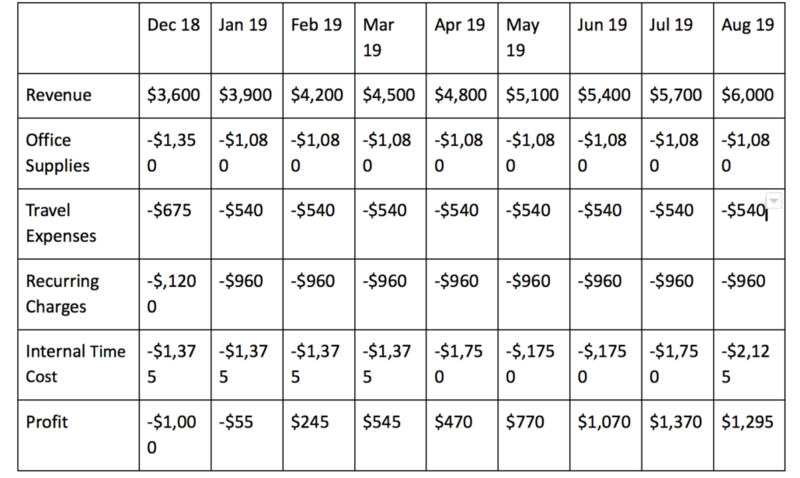 If you were to double your $150 average to $300 per month growth, you would see that at the end of 2019, your revenue target will be $7,200. Keeping with the averages and the math that we have done so far, we can now figure out how many clients you need to bring on to satisfy these targets. Cool huh? If you recall from our initial example, Bombshell, Inc. charges a monthly retainer fee of $1,000 per month. 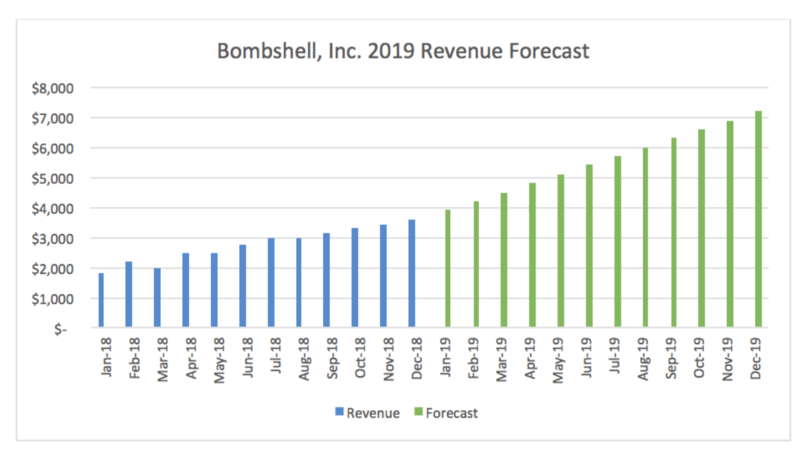 The forecasted growth of Bombshell, Inc. during 2019 will be from $3,900 in January to $7,200 in December or an annual growth of $3,300 per month. This means you would need to get one new client (assuming $1,000) retainer every 110.6 days (~3.5 months). Outside of taking averages, there are many more complex math formulas that can be used to get a more accurate forecast. If you’re interested, I’ll be happy to walk you through them. You can sign up for a spot on my calendar here. As mentioned above, it’s also very important to set forecasts for your expenses and profit. Whereas we want to increase our targets for revenue, we also want to decrease our expenses. Thus, driving up our net profit. Look for ways to reduce your expenses by 1/3 at a minimum. What items are you spending money on that you can either get for cheaper or can you get rid of the expense all together? As you can see, there has been a lot of work leading up to this part. Here’s the good news, the hard part is over. If you have done the math correctly, all you have to do now is plug in your numbers to an accounting tool (preferably) or an excel file. Xero is an accounting system that my clients and I use. They have a very user-friendly budgeting tool that you can use to integrate into your accounting processes. You can either increase/decrease your targets by a whole number or in percentages, either one time or recurring out for a period of months. It is important to note that when looking for new clients, you will want to target to increase your costs or time investment no more than 50% (if you can get it lower, even better). From our examples above, we can now incorporate and generate a budget based on Bombshell, Inc.’s revenue, expenses, and profit. We will start with a snapshot of December 2018 and go to August 2019. Our goals for the revenue were established at $300 per month and, we want to decrease our expenses (except for our $250 per hour internal cost) by 20%. Assuming our revenue goals and client acquisition goals, you will notice that we will have budgeted cost increases in our internal labor in April and August. This rate is assuming our best client, client “C” is still costing one hour per month and we are budgeting a 50% cost increase (1.5 hours) on top of our commitments. Recall the current time commitments of existing clients when reviewing the budget below. As you can see, we begin 2019 with a net loss each month but by the second half of the year, we are profiting over $1,000 each month. Now with all businesses, almost nothing ever goes according to plan. You bring on two clients in one month, or you need to make last-minute travel plans to close a deal. That’s the purpose of the budget. The budget is flexible but it gives you some boundaries to work in. You can be over travel one month and be under for the remainder for the rest of the year. This isn’t to say to go buck wild and spend $5,000 on first class air fare in January (even though the budget for the whole year allows it). With sensible budgeting, and reasonable expectations, you will be in a position to grow, and be able to have the flexibility financially to take on whatever comes your way. By completing these three steps listed here, you will be light years ahead of so many other business owners. Although this planning process can look challenging and daunting, it really isn’t. It’s only applying the knowledge you already possess about your business and then putting it into tools that will guide you to the highest levels of success.